Passport Book Or Passport Card — Which Is The Best Option? When you’re planning international travel, the first thing you want to check is your passport. You need to make sure it’s not expired, missing, or if you need to apply for one for the first time. If you aren’t familiar, America offers it’s citizen two passport options. 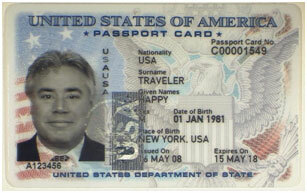 The passport book is the most common option. The book is valid for ten years and allows you to travel internationally by plane, train, sea, and automobile for a fee of $145 for first-time applicants and $110 if you’re renewing. If you’re applying for passports for the kiddos, their passports are $115 for first-time applications and $80 for renewals — and are valid for five years. The second option is the passport card, which is $65 for first-timers and $30 for renewals (for adults) with children’s first-time applications being $50 and $15 for renewals. The passport card is a plastic card about the size of a credit card, so it will fit right into your wallet. Sounds like a good option, right? Well, there are a few stipulations if you opt for this version of the passport. Air travel is not an option with the card, but you can travel by land border crossings or sea ports-of-entry. The other drawback of the passport card is that you can only venture to Canada, Mexico, Bermuda, and Caribbean countries and territories. If you or the person you’re planning to help apply for their passport isn’t planning any in-flight travel and destinations will stay in the scope of these countries — the passport card will save you money. No matter which option you go with, be sure to apply for it in the right amount of time before your scheduled trip as it can take up to 4-6 weeks to get to you. If you’re in a jam and need it urgently, the passport agency offers a 2-3 week expedited option for $60.